Before the first official bomb lands on Syria, the New World Order plans to vaccinate 2.2 million Syrian children under the age of five, reportedly to protect against polio. 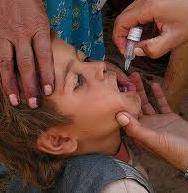 The global plan now includes all of the Middle East, seeking to vaccinate 23 million children under the age of five. That went so well in Africa, India and Pakistan that surely Big Pharma profits going in and out, in caring for all the syndromes that develop — later if not immediately — and earning a tidy sum under the snake oil promise that vaccines prevent disease or provide protection against them. Evidence show that vaccines are too loaded with toxins and nanobits of who-knows-what to risk the side effects or sub rosa purpose of today’s vaccines. But from a new book, authored by a medical doctor who dug into the history of vaccines, we learn vaccines have been militarized since year 1. Whistleblower and Merck vaccine scientist, Dr. Maurice Hilleman, admitted the presence of Simian Virus (SV40), AIDS and cancer viruses in vaccines. Showing a graph of polio outbreaks in the US, she notes that the first one, in 1916, can be attributed to Rockefeller experiments with weaponized polio in New York City, a few miles from the epicenter of the outbreak. The fatality rate of that 1916 outbreak was 25%, “the highest ever recorded in history” for polio. Of 23,000 patients, over 5,000 died. The second outbreak, lasting over a period of several years and peaking in the ’50s, can be attributed to several factors, Dr. Humphries says, including cause, treatment, susceptibility factors, and the very definition of polio. Significantly, arsenic and DDT were widely used then, and women switched from natural breastfeeding to powdered formulas and bovine milk contaminated with DDT. “Exclusively breast-fed infants were exempt from polio,” she reports, highly recommending the Beyond Conformity website at http://www.beyondconformity.co.nz/. “Unbeknownst to most doctors, the polio-vaccine history involves a massive public health service makeover during an era when a live, deadly strain of poliovirus infected the Salk polio vaccines, and paralyzed hundreds of children and their contacts. These were the vaccines that were supposedly responsible for the decline in polio from 1955 to 1961! But there is a more sinister reason for the “decline” in polio during those years; in 1955, a very creative re-definition of poliovirus infections was invented, to “cover” the fact that many cases of ”polio” paralysis had no poliovirus in their systems at all. While this protected the reputation of the Salk vaccine, it muddied the waters of history in a big way. The US Food and Drug Administration is intimately involved in the eugenics program, as evidenced by its approval of drugs that when used as intended cause 106,000 fatalities a year, while at the same time criminalizing raw milk which has proven health benefits, especially to the immune system. The full breadth of the medicinal benefits of marijuana is not fully explored, but its proven benefits include anti-seizure, cancer remission, sleep aid and improved mood and appetite. Yet, the US is one of the last domains where the 34-million year old plant is criminalized, while alcohol is promoted. Acquiescing to the WHO’s vaccination program seems to guarantee massive corporate and political profits along with a generation of toddlers who will become sickened and immuno-suppressed, and may even lose their ability to procreate. Just look at the US outstanding rates of autism, allergies, Epstein Barr, and other immuno-suppressed diseases, along with the rates of neurological disorders. After Big Pharma come the genetically modified seeds and fast food joints, and oh yeah, economic dominance over China and access to the world’s easily accessible oil reserves. The globalists march in lockstep with the plans of the Grand Chessboard. Syria is on target for takeover.